Travel to anywhere in Japan today and one of the first things you’re likely to see, especially in rural areas seeking more tourists, are stores and farmers’ markets selling local agricultural products based on a locally “famous” fruit or vegetable. Whether it’s Hokkaido corn, Yamagata cherries, Nara strawberries, Ehime mandarin oranges, or Okinawan limes, the country’s rural areas have stepped up their efforts in recent years to market their hometown foods domestically, as well as internationally, to ever-more sophisticated consumers. Japanese cuisine has, of course, become a worldwide boom, a distinguishing feature of Japanese culture. Various local and national surveys of foreign tourists show that “eating Japanese food” is a major reason, often in the top three, for visiting the country. At home, even the casual visitor quickly notices there is something of an obsession with food, especially on variety TV programs that feature perky young men and women traveling the country and sampling every variety of gastronomic delight one can imagine before replying with the obligatory oishii (delicious) or umai (tasty), delivered in a high-pitched and excited voice. Based on its current popularity and saturation media coverage, one might think that Japanese food had nothing to worry about. However, beneath all of the promotional campaigns — often unnoticed by either supermarket shoppers or restaurant customers — lies a troubling reality. 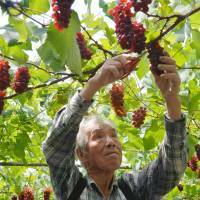 Climate change is threatening Japanese agriculture in unprecedented ways. If the gravest predictions turn out to be true, by the end of this century, the world could view what are now fairly common products at the Japanese dinner table as either rare luxury items or something that people used to eat, but no longer. Climate change science requires years of careful analysis before even the most cautious conclusions and predictions are issued about how climate change is affecting the world as a whole or specific regions, and what kinds of climate shifts can be expected. However, policymakers have to adopt climate change mitigation policies for the future that are based on data that was gathered and analyzed many years ago, which leaves a lot of room for political arguments about whether the future will be as, or more, dire than the scientists conclude. 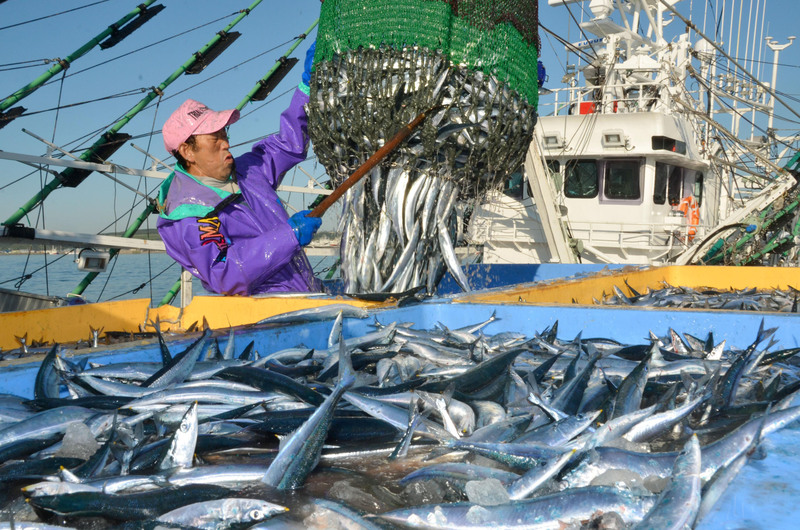 Nevertheless, for Japan, several studies in recent years paint a grim picture for climate change’s effect on Japanese food production over the remainder of the 21st century. Takuya Nomoto, an Environment Ministry official, noted at a 2013 symposium that climate experts were predicting the country’s average temperature would rise between 2.1 and 4 degrees Celsius by the end of this century. The rise will bring severe weather patterns, including heavier rains and floods, which is predicted to affect Japan’s most basic crop: rice. “Yields of irrigated rice will be increased, but the quality might be negatively impacted,” Nomoto told his audience. 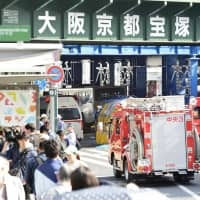 As long ago as 2008, the World Wide Fund for Nature warned in a report entitled “Nippon Changes” that research showed climate change would mean an increase in the number of extremely hot days (over 35 degrees Celsius) in Japan, and a decrease in the number of frost days by 20 to 45 days per year. Over the course of this century, mean precipitation was expected to increase by more than 10 percent nationwide. During summer, however, precipitation was expected to increase by 17-19 percent over current levels. Increases in the frequency and intensity of extreme weather events such as heat waves and heavy rainfall were also predicted. 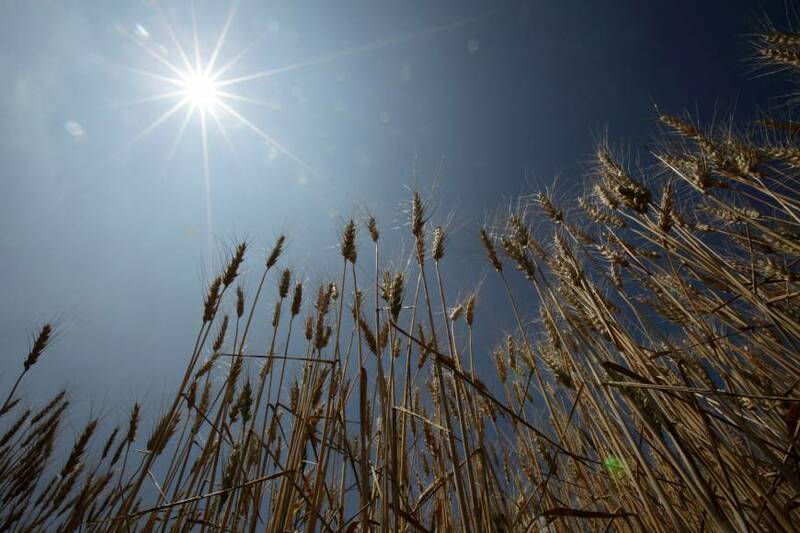 “The impacts of warming temperatures will have a substantial effect on Japan’s agricultural industries,” the report said. 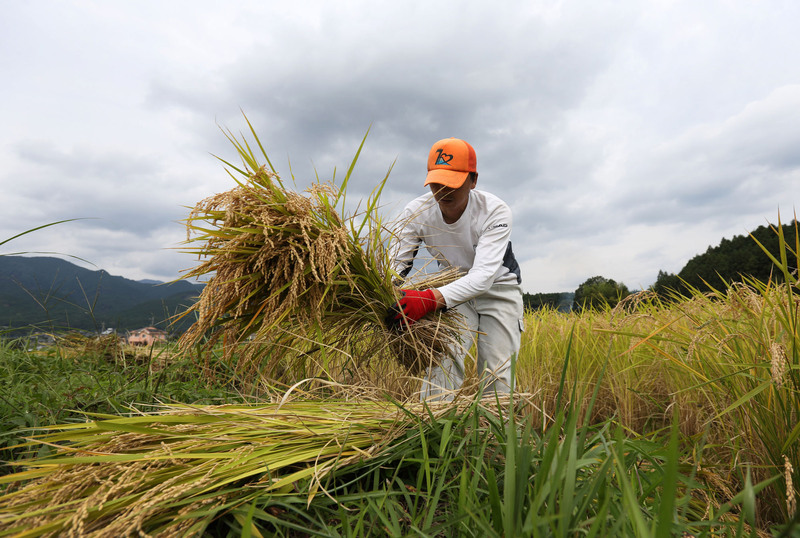 “Regional temperature increases have already affected Hokkaido’s agricultural sector in a number of different ways — favorably for rice farming and unfavorably for fruits,” the report said. “In fact, temperature increases have negatively affected some fruit crops, and occurrences of abnormal fruit have been identified throughout Japan — from grapes not turning red to peaches with brown flesh. The changes will not be limited to land-based agricultural products. 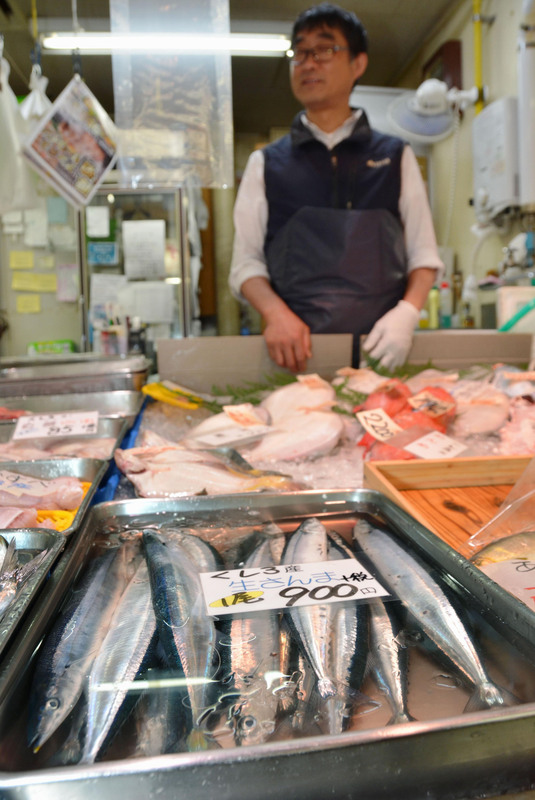 The World Wide Fund for Nature report, citing figures from the environment and agricultural ministries, warned that certain fish species that have become synonymous with the arrival of autumn, especially Pacific saury and salmon, might be harder to come by as waters, especially in northern Japan, warm up and ice floes near Hokkaido shrink, depriving the fish of a critical source of nutrients. The projected impact on Hokkaido’s agriculture sector could be especially dramatic because of its importance to the rest of the country. 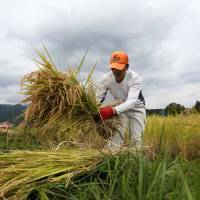 While paddy rice yields are predicted to decrease in Tohoku, Hokkaido has been growing high-quality rice for years now, once an unthinkable proposition due to the cold climate. However, the government predicts that by around 2060, climate change will mean paddy rice yield increases in Hokkaido, and decreases in Tohoku. Boasting about a quarter of Japan’s cultivated land area, Hokkaido is the country’s leading prefecture in 18 agricultural sectors. As of 2013, it produced 65.5 percent of the nation’s wheat, 30.7 percent of its soybeans, 80 percent of its potatoes, 83 percent of its salmon, 88 percent of its scallops, 54 percent of its onions, 45 percent of its buckwheat and 46 percent of its corn. 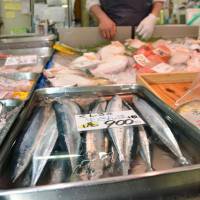 Hokkaido’s calorie-based food self-sufficiency ratio is around 200 percent, the highest in Japan. Five other prefectures (Aomori, Iwate, Akita, Yamagata and Niigata) had self-sufficiency rates of more than 100 percent. Furthermore, while nationwide, the value of agriculture has been declining in recent years, Hokkaido’s agricultural production has remained at around ¥1 trillion annually since 1990. By contrast, the Ministry of Agriculture, Forest and Fisheries’ fiscal 2014 report on food, agriculture and rural areas in Japan has set a food self-sufficiency ratio target of 45 percent on a calorie supply basis by 2025, and 73 percent on a production value basis, also by 2025. That’s because, as of last year, the country’s self-sufficient ratio was 39 percent on a calorie basis and 65 percent on a production value basis. 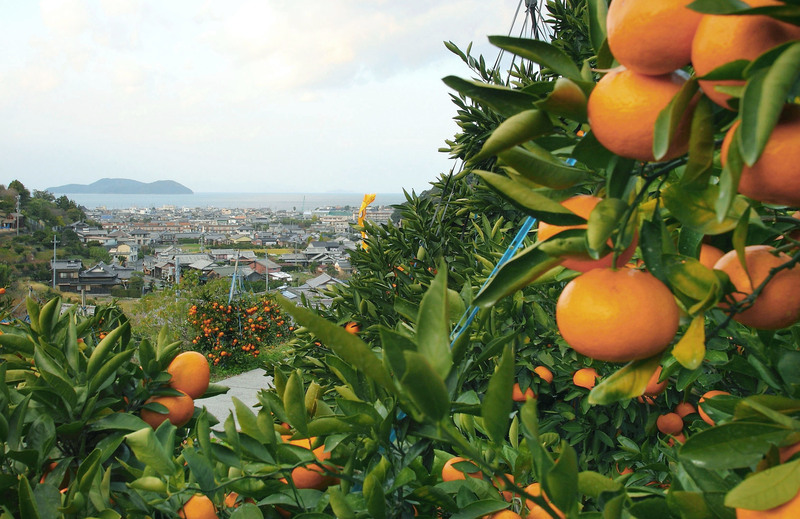 In the city of Matsuyama, Ehime Prefecture, the mandarin orange is king. Prefectural officials offer business cards with a manga-esque character called “Mikyan,” that, on first glance, looks like a teddy bear (though with green leaves for ears). The figure can be seen in stores throughout the city. Ehime mandarin orange juice is now sold nationwide. In Matsuyama, one can buy everything from jam and salad dressing and pies to a mandarin orange-flavored liquor. Farmers do what they can to deal with climate change, but the effects of climate change have a ripple effect from farms to distributors to, ultimately, consumers. In 2007, following a U.N. report on worldwide climate change, Japan’s agriculture ministry released a study that summarized the impact of global warming on Japan and noted that certain fruits such as apples, mandarin oranges and grapes would be strongly affected. Assuming that by 2060 the temperature in and around Japan will have risen by an average of 3 degrees Celsius, the ministry predicts that areas suitable for growing apples and mandarins will gradually move north. 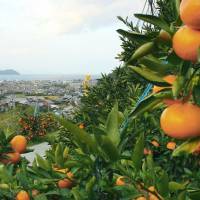 Mandarin oranges, normally associated with western Japan and Kyushu, could even be grown in the southern Tohoku coastal region, the ministry said. The changes also mean that prefectures with larger populations, especially those with younger workers, could become the strongest competitors of rural prefectures. 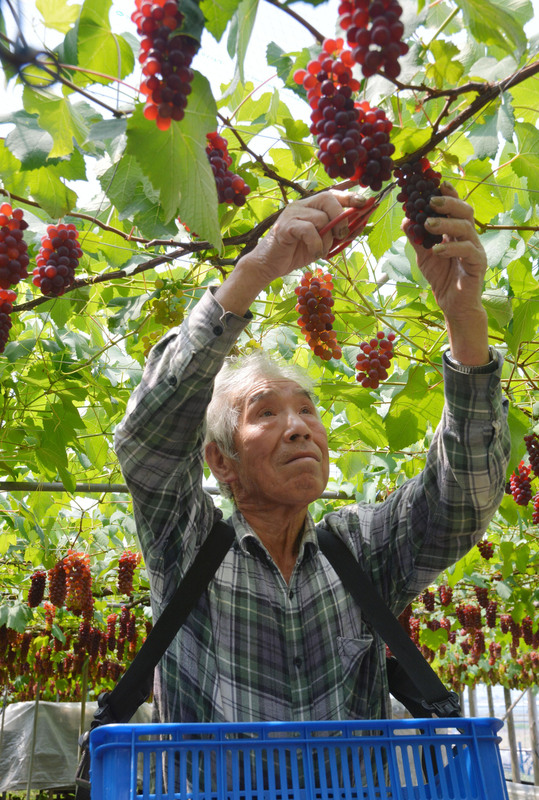 At the same time, with the number of traditional rural farmers declining and rapidly aging, thereby increasing the amount of uncultivated land nationwide, the government is making more efforts to get new players into the agricultural sector. This includes the so-called business farmers. Japan wants to increase the percentage of farmland cultivated by business farmers (including those known in the U.S. and Europe as “big agriculture” — huge corporations involved in all aspects of agricultural production) from around 50 percent today to 80 percent by 2025. Under an agricultural ministry scheme, business farmers are envisioned to be certified as new farmers and community-based farm cooperatives. They will include individuals but also corporations. This is not new. The number of corporation farms tripled between 2000 and 2015, and more than 7,000 corporate farms entered the sector after the revision of the Agricultural Land Act of 2009. While one of the main aims of the program is to make use of farmland that is being abandoned for nonclimate change reasons, the government hopes that better management of the agriculture sector via the introduction of new players will also strengthen management efforts on currently cultivated lands to tackle a problem that is partially rooted in climate change — agricultural damage due to the foraging of wild animals. Over the past decade, the agriculture ministry estimates that crop damage to wild animals has ranged between ¥20 billion and ¥24 billion annually. The majority of losses are due to deer and wild boars. Some of the steps that Japanese farmers have been advised to adapt to global warming are specific. For example, the agricultural ministry has said that late planting and the direct sowing of rice can help prevent the occurrence of white immature kernels due to high temperatures during the ripening period. The Nikomaru rice variety was recommended for planting, as it’s hardier and produces fewer white immature kernels than other types. Grapes are especially sensitive to changes in climate, and abnormal coloration of some grape varieties due to high temperatures is a danger, although the government recommends using Ishiji and Tamami grape varieties because they’re less sensitive to what is called “rind puffing,” which is caused by high temperatures during the ripening period. More generally, the government is providing increased funding to the agriculture sector to make it more internationally competitive. 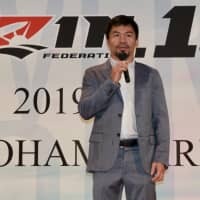 While much of the funding is on promotional efforts or making different sectors more efficient, Prime Minister Shinzo Abe’s administration has also recognized that if it is going to create a larger export market, it needs to provide funds to help farmers mitigate the effects of climate change. Should the highly controversial Trans-Pacific Partnership agreement ever become a reality, many domestic farmers are convinced that it would open up bigger markets in Asia for local products, even as opponents warn that what it will really mean is an increase in the number of huge corporations entering the agriculture sector and using practices that turn farms into factories. This could mean an increase the amount of carbon emissions, thus making the problem of climate change in Japan even worse. In the meantime, tourists and residents in Japan continue to find themselves with a literal smorgasbord of food from the land and sea to choose from. 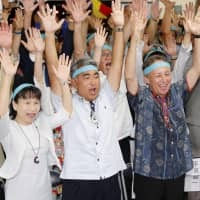 With the government announcing in late July that a new economic stimulus package worth more than ¥28 trillion will at least partially focus on new ways to increase farm exports, it’s clear expectations are that whatever happens to fruit, vegetables and seafood due to climate change in 20 or 30 years from now, they are presently viewed as an valuable international market, one that, on paper, is expected to grow in the coming years and potentially revitalize all of Japanese agriculture. Unless, of course, Mother Nature, in the form of climate change, intervenes much faster, and much more severely, than current predictions indicate, reducing yields. Hotter, longer summers and excessive rainfall in some areas and droughts in others that damage fruit and vegetable crops, warming coastal areas that are unsuitable for certain fish species, could mean a drastic decline in agricultural items that form the basis of of national and regional promotion campaigns. If so, it’s possible to imagine a not-too-distant future in which hosts on food programs indicate their pleasure at sampling some now common local fare by exclaiming not oishii or umai but “mezurashi” (“What a rare find”).